Why Does Crossfit Use Rowing? and Why the Concept 2 Rower? Well as it turns out there is more than one reason why CrossFit has adopted the rower over run-of-the-mill cardio machines, and we’ll talk about them all. Following that, I’ll tell you why the Concept 2 Rower is the rower of choice and the most popular rower in the marketplace. 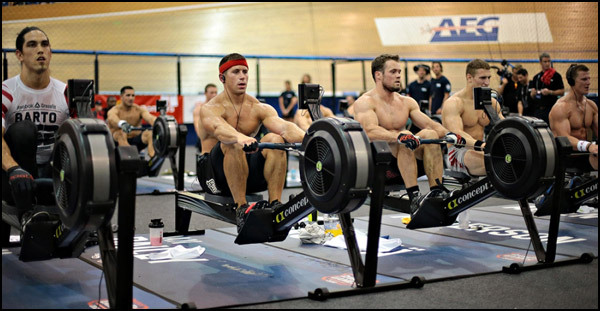 Then we’ll talk about who has the best overall pricing on the Concept 2 Model D rower, the model of choice for CrossFit. Last updated December 2017 – minor spelling and grammar revisions. At first glance, you may think that rowing is just a different kind of cardio that focuses on the upper body rather than the lower like stair climbers, treadmills or spin bikes do. It would be logical to assume that the back does most of the work in a pulling movement, and while that may be the case in static exercise like a weighted row, that is certainly not the case when it comes to rowing on a row machine. Rowing is definitely a full body movement; it uses almost every major muscle group in your body including the lats, quads, hamstrings, glutes, abs, obliques, the lower back, shoulders, and arms – both biceps and triceps. And since you’re using so many muscles at once, you will most certainly be elevating your heart rate. This makes it a much more efficient workout than running in place or spinning; both of which primarily use only the lower body. You might not think that a movement that involves sitting could burn all that many calories per hour, but you might be surprised. Rowing is metabolically challenging, and it can burn upwards of 1000 calories per hour. Just consider how many muscles are working together in harmony to complete each stroke. You’d have to push yourself pretty damn hard using an elliptical to hit those numbers, and you’d still only be challenging (I use the word challenge loosely in this case) your lower body. So if you’re going to put in the time, you may as well be working the whole body rather than just the bottom half. You can burn just as many calories in less time, or better yet, you can burn twice as many calories in the same time. The beauty of rowing is that it never becomes obsolete simply because your endurance or strength improves. Rowing can be as breezy or as challenging as you choose to make it, as the simple act of rowing harder or rowing faster increases difficulty exponentially. Be it on a water rower or the Concept 2 rower, the resistance becomes greater the harder you pull, so push yourself on a rower and your cardiovascular health, endurance, and overall strength will always continue to improve. Rowing is an extremely safe form of cardio. It’s easy on your joints; especially those knees and ankles; and it can be performed at high endurance levels by nearly everyone, and with no fear of injury. 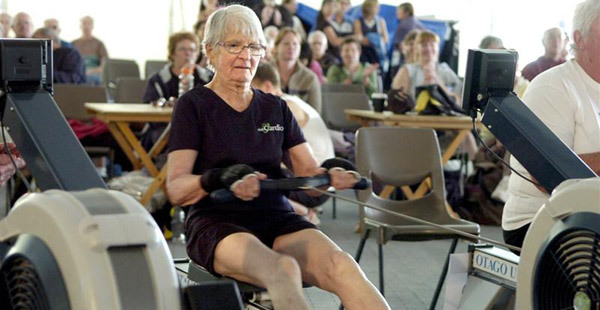 It’s also beneficial for joint health since rowing moves your joints through such a large range of motion. Most people don’t have access to true outdoor rowing; at least on a regular basis. I mean, how many of us have homes that back up to a lake? So if you want the health and fitness benefits of rowing, you’ll probably need access to a rowing machine. On the other hand, if you want to run, jog, walk, cycle, or climb, you don’t necessarily need a treadmill, spin bike, or stair climber. You can just go outside and jog down the street, hop on a bicycle and go for a ride, or find some stairs or a big hill to climb. Owning machines for any of these activities is simply due to a preference to be indoors rather than out. That’s all fine and good, of course, but the advantage of the indoor rower is that it’s a full body cardio exercise that you probably couldn’t do without the machine. 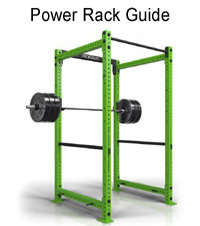 A commercial, high-quality row machine that will last a lifetime can be had for around $900. 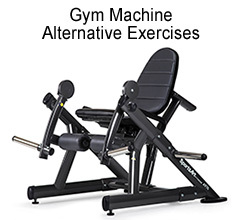 Compare that price to a commercial treadmill, recumbent bike, elliptical machine, climber, or any other cardio machine and you’ll see a rower is much more affordable. Some of the better pieces of cardio equipment out there can cost five or six times what a rower will cost you. 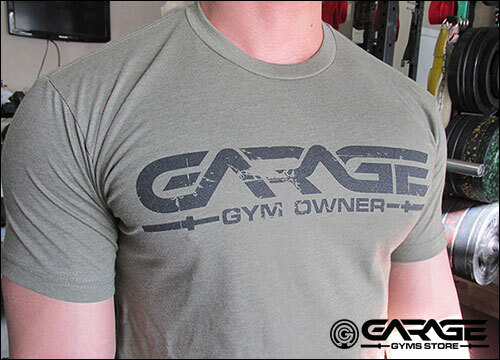 So if you had to provide a dozen or more identical pieces of cardio equipment for your gym or CrossFit affiliate members, what would you prefer? Rowers that cost roughly $900 each that offered an efficient, full body exercise, or the typicl space-stealing treadmills or climbers that sell for at the very least a few thousand dollars each and offer nothing in the way of fitness that couldn’t be achieved by simply going outside and running around the building? 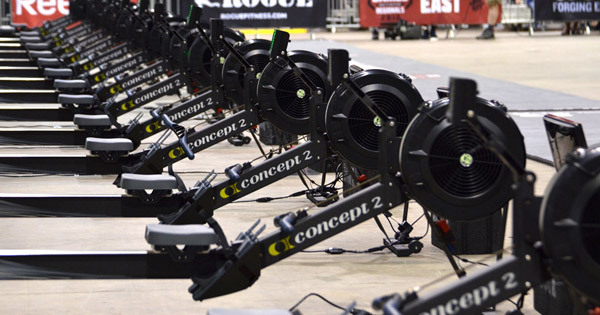 Why is the Concept 2 the rower of choice for Crossfit? Now that CrossFit is such a big deal, you have probably seen more than your fair share of Concept2 rowers out there, but it’s not the only rower on the market. Google search rowers or get on Amazon and you’ll see there are dozens of various brands and models to choose from. However, the Concept 2 is still the most prominent. Heck it is the only rower I’ve ever seen in a commercial gym, it’s the only rower most fitness retailers offer for sale, and I have yet to see a different rower in anyone’s garage gym. How can this be? 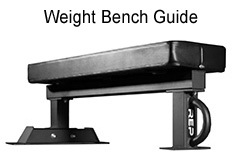 Superior Design – I think the primary reason the Concept 2 is so popular is it’s design. It’s designed so well that even the wearable parts last for many years even with constant use. A Concept2 Rower just does not break down like cheaper rowers do. Even if you use your rower every day of the week for years and finally need to replace a bearing or some other wearable part, the parts are readily available from the manufacturer at very fair prices. Each Concept2 model is backed by a warranty as well. Cost – Speaking of fair prices, the MSRP of $900 for the Concept 2 Model D Rower is just amazing considering this is a commercial rower. No other commercial cardio equipment can come close to that price. Those LifeFitness and Precor cardio machines at the gym sell for upwards of $5000 a piece, so $900 is nothing by comparison. Even the upgraded Model D with the PM4 Performance Monitor is only $1050. Performance Monitors – The Performance Monitor is yet another reason I believe that the Concept 2 is so popular. Even if you don’t upgrade yours to the PM5 and you stick with the PM4, you’re still getting a lot more features than you would with other rowers. In addition to the obvious distance and calories tracking, there are games, races, and ability to log and track your workout data. Many rowers don’t come with any monitor at all; you just row until you feel like you’re done. 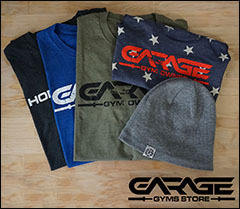 Accessories – FInally, the Concept 2 has some very interesting accessories not available with other brands including such things as a receiver for Polar heart rate monitors, slides for making your indoor rowing feel more like real on-the-water rowing, a dynamic link for team rowing, and the previously mentioned PM5 that allows racing between different machines. Check out the video below to see what the slides and dynamic link are all about. Pretty neat stuff. Where is the best price for the Concept 2? The MSRP for the Concept 2 Model D Rower in either black or grey is $900 plus shipping, but many retailers ask more than that. Rogue never asks more than MSRP, and even often times has rowers from events on sale for a bit less than MSRP. I suggest snatching one of those up if you’re in the market as they typically were only used for a couple days. There are a lot of options when it comes to indoor cardio, and there are also many options when it comes to choosing where to buy your equipment. If you’re new to CrossFit or the fitness world in general and you are not familiar with the Concept 2 rower, I suggest that you check out some fitness sites, the CrossFit forums, and even just ask around. I think you’ll be hard pressed to find someone who doesn’t agree that the best cardio you’re going to get on a machine is going to be on the Concept 2 Rower. Concept 2 Rower vs the WaterRower – Very structured and well-written post comparing these two brand name rowers. I recommend reading this if you’re considering buying either of these rowers. Why Rowing? 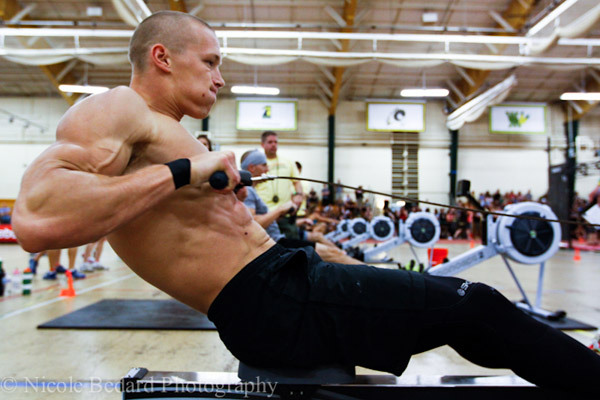 Crossfit.com – Get the opinions of other Crossfitters regarding the benefits of rowing. Users cover all kinds of benefits; some of which weren’t addressed here. 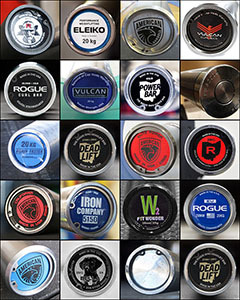 Concept2 Website – Check this site out for more technical data on the rowers like specifications, warranty information, and shopping for replacement parts. Rowing is one of my favorite total-body cardio workouts on off days from marathon training! I only wish I could do it more often. Even 5 minutes is such a good workout! Thank you for the very informative article on rowing and use of the Concept2 Rower and why CF uses them. Very helpful. They use Concept Ergs because someone got smart and went to the source. What do actual rowers use? There is your answer. Everything else is a cheap imitation. Concept2 is where it is at. I want to take a moment to point out how AMAZING the slides are. It is the most under talked about accessory. A few years ago I learned how to row on the water. It is so much fun and challenging. Balance and coordinated movement are really important. The slides actually make it realistic to use the rower. Most people just try to crank away. But when you slide forward too fast on the water you brake your momentum and slow the boat down. You have to be smooth, explode back and ease forward at around a 1/3 push back, 2/3 slide forward ratio. The slide accessory makes you row much more coordinated to stay smooth. Again, it comes pretty close to feeling like you are gliding across smooth water too. Anyone who thinks it is silly or unnecessary needs to give them a try. 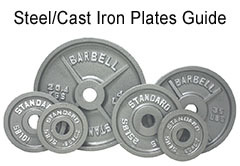 I don’t know why Crossfitter’s don’t use them more. Thanks Johnie. I’ve been hoping someone would talk about that. I haven’t gotten to try it yet myself. I’ve got a Concept2, but other than the HR monitor, no accessories. Actually, the laws of physics control motion. Accelerate the slide to stern on the water, and the boat accelerates FORWARD. It has to. Conservation of momentum. You and the boat are a unit, one part moving back causes the remainder to move the opposite direction. Just slide to stern quickly from a stop, and watch the boat move forward. But must alter seat direction and grab water to maintain the momentum and then use the oar power. It requires greater coordination. so no coaches advocate it. It absolutely adds boat speed. The Concept2 rowers are beasts. I have had mine since 1986, 29 years now. Last year got a new chain return mechanism for $108 . Not sure how many million meters I have on it. Two million the past 6 years, almost all recorded. Major component of my full recovery from emergency bypass surgery nine years ago. And not expected to live three years beyond that. I now scull again, played basketball for a few years afterwards, and now play volleyball regularly with people half my age. For hours and hours. Through judicious heart rate training, and better than the MIND diet, my max heart rate is over 180, despite being 62 years old. Being a sculler, volleyball is easy. Mr. Wagner hello iam a recovering cardiac pt. Sleep apnea induced. However my overall recovery has been good, but I have been searching for a tool/vehicle to get me over the top…..Ian a really Big dude, but very agile for my size 6’6″ 460lb. I would like more elaboration on how the rower inhanced you overall RECOVERY and HEART HEALTH. I was a beast before my illness, I Seek to RETURN…..lol….thanks in advance Good Sir. please go to stridetogreathealth.com to continue a more detailed conversation. I’ve been competing in Olympic rowing for many years, and all the rowing club I know (in Spain) use concept2 because they are the most assimilated to paddle in the water. I know this is an old posting/review, but it is still relevant today. Thank you for this review and explaining all of the things that one needs to look at when deciding on a rowing machine. Also thank you all for your comments, since we learn from other people’s experiences. Low impact, cardio workout in mere minutes…. without leaving your house! I definitely prefer this over walking/fast walking/running, hands down. I’m sure once I delve further into it’s techie attributes, I’ll be even more amused. I purchased my Concept 2 Model D in April, 2012. Since then I have, in almost daily use, rowed 18 million meters. I am certain this machine will not have to be replaced in my lifetime. Row legs first, arms second. Any knowledgeable weightlifter knows arms can never compete against the legs. The legs just diminish the arms if used together, wearing them out, not adding power. Biceps are minimally involved, as rowing is a palms down activity. Elbows are pulled back by the lats, rhomboids, posterior shoulder muscles. Rowing, the hand, palm up, is not flexed at the elbow to the shoulder, which is what the bicep primarily does. Unless you row a huge load, you will not understand how to truly row with power. A curved back is weak. I tried to go to the website you’d posted last year at this time to get more information regarding a response to a previous poster and the site is no longer valid. Is there some other website where I can reach out to you to learn more about proper form? Thanks for your comments, they’re very informative!